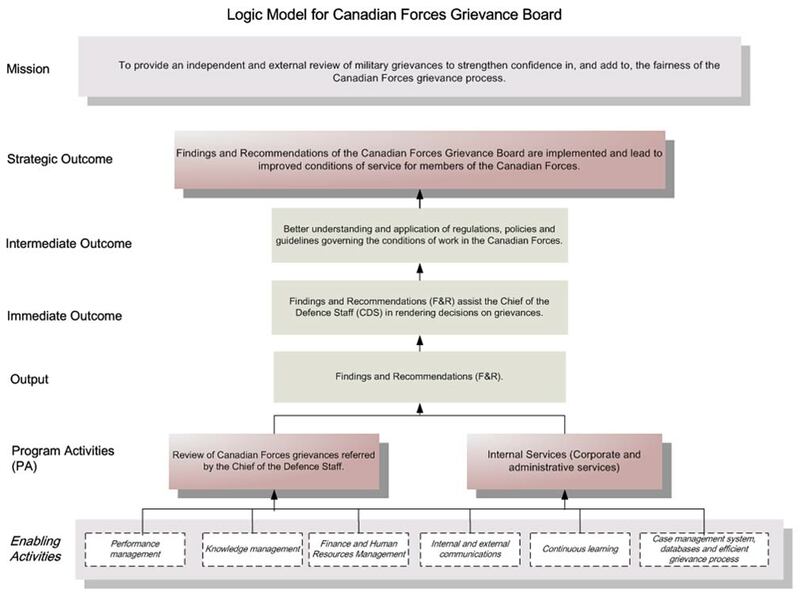 2.1 Strategic Outcome - Findings and Recommendations of the Canadian Forces Grievance Board are implemented and lead to improved conditions of service for members of the Canadian Forces. The Board conducts objective and transparent reviews of grievances with due respect to fairness and equity for each member of the CF, regardless of rank or position. It ensures that the rights of military personnel are considered fairly throughout the process and is committed that its Board Members act in the best interest of the parties concerned. Complaints can be indicators of broad or systemic issues that may offer useful information to prevent problems or to improve policies or procedures. The Board meets the challenge to justify its raison d'être by ensuring that grievors and leadership within the CF are aware of the value-added that the Board provides in its F&Rs. The Board's Logic Model at Figure 4, illustrates how each of the items contributes to the fulfillment of the Board's mission and the achievement of its strategic outcome. Expected Results: Better understanding and application of regulations, policies and guidelines governing the conditions of work in the Canadian Forces. These expected results are the longer term result that flow from the Board's activities, outputs and immediate outcomes and which demonstrate progress towards achieving its strategic outcome. As the Board is reaching its 9 year mark, it has not yet been able to verify substantial evidence of this result as it may be subject to influences beyond the Board's work. 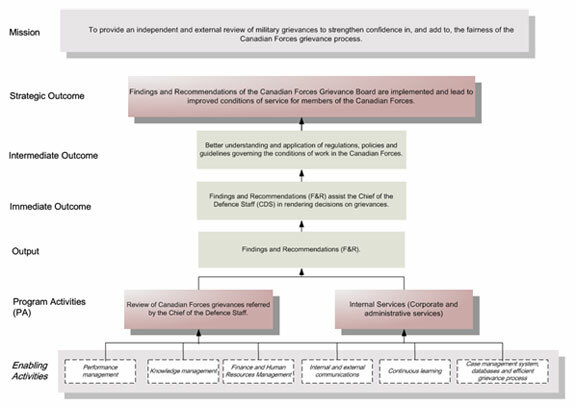 Benefits for Canadians: The Board's unique position as an independent and external organization to DND and the CF adds adjudicative fairness to the CF grievance system and contributes to improved conditions of service for its members. The Board gathers information from grievances and shares that information with senior CF leadership through publications and outreach activities targeted at various stakeholders audiences. The Board endeavors to ensure stakeholders benefit from its wealth of experience, knowledge and expertise and are aware of the value-added the CFGB brings to the military complaint resolution processes. Performance Analysis: After more than eight years in operation, it is clear to the Board that information gleaned from its review of grievances should be shared with decision-makers to prevent problems and inform future decisions. Acting on this idea, the Board launched Perspectives, a newsletter targeted primarily at senior CF officials at DND Headquarters. In its first issue, published in the third quarter of 2008-09, the Board shared some of the valuable lessons learned from the more than 1,000 cases for which it has provided F&Rs since its creation in 2000. The first issue of Perspectives summarized three major trends reflected in a number of grievances: inconsistencies between regulation and policy; errors in recruit enrolment; and problems with procedural fairness. Perspectives was so well received by senior officials that the Board has decided to publish it on a regular basis. Issues of Perspectives are available on the Board's Website at the following address: http://www.cfgb-cgfc.gc.ca/English/PandR_Perspectives.html. The Board also published an insert in the Maple Leaf, the weekly national newspaper of DND and the CF, which included background information on the Board and provided summaries of cases of interest reviewed by the Board. "I just wanted to let you know that I very much enjoyed receiving a copy of your first issue of Perspectives... Very useful to see the trends and issues that you and your team are finding in your work. I will be circulating Perspectives to my senior military and civilian personnel as there are some issues where I believe we can influence the way ahead." Lessons Learned: One of the benefits of having military grievances reviewed by an agency outside the CF is that the Board with its well-developed Information Management System is able to identify general trends, flawed or inadequate policies, areas of dissatisfaction and problems of a systemic nature and report them to the leadership, key decision-makers and professionals associated with conflict resolution in the CF. Also, judging by the comments received on Perspectives, it is apparent that it is filling a need within the CF. There have been certain trends or an increase of cases in certain areas during 2008-09. The Board has received a significant number of grievances where erroneous information was provided to new recruits, either during their enrolment process, or in actual enrolment messages. The Board has also seen an increase in the number of grievances where members contested the administrative measures imposed or their release relating to misconduct on the basis that the underlying cause of their behaviour was a medical condition, such as post-traumatic stress disorder. Finally, the Board has reviewed a number of cases where new pilots were complaining that their pay was being erroneously calculated. In the latter cases, having concluded that the CF had made an error, the Board was able to make a systemic recommendation which resulted in the review and correction of other pilots' files. Table 1 outlines the distribution of outcomes of the 119 cases completed by the Board for the period. The Board established an average six-month timeline to complete a grievance. A process introduced in 2007, in coordination with the DGCFGA, with the aim of improving the overall efficiency of case review at the FA level, resulted in increasing the elapsed time the grievance would stay at the Board. The decline in the number of cases completed at the Board within the six-month average is shown in Table 2 for cases referred in 2007. In 2008, after the process was modified and changes were introduced to the internal review processes, the Board regained the desired level of efficiency, where 79.3% of the 2008 cases referred and completed during 2008-09, were done under the six-month time limit. Since its inception, the Board has worked hard to maintain a steady state of operations where its inventory of cases does not contain files older than one year. The last three years have seen a considerable improvement. Last year, only 33 completed cases had been with the Board for more than one year, mainly due to their complexity. By the end of the reporting period 12 cases older than 1 year remain in the Board's inventory. For the period covered by this report, the Board received CDS decisions in response to 124 grievances. Eight grievances for which the Board had issued F&Rs were withdrawn at the CDS level. As shown in Table 3, the CDS fully endorsed CFGB's F&Rs and accepted informal resolution in 71.5% and partially endorsed 16.3% of the recommendations from the Board. * No standing – the Party does not have the right to make a legal claim or seek judicial enforcement of a duty or right (e.g. a non-member of the CF). The Board developed a mail survey, designed to seek feedback from grievors and started sending out the surveys in 2005. For the period covered by this report, 36 grievors responded to the survey. The following results cover questions in the survey relating to the grievor's satisfaction with the impartiality of the Board's F&Rs and the fairness and transparency of the review process. Objectivity – 69.5% of grievors agreed and strongly agreed that, without considering the overall satisfaction with the outcome of the grievance, their grievance was reviewed by the CFGB in a fair and unbiased manner. Procedural fairness – 86.1% of grievors agreed and strongly agreed that they were provided with the appropriate disclosure of information and given the opportunity to respond. Lessons Learned: The Board consistently seeks to improve its internal review process to save time while maintaining the quality of the F&Rs. One key initiative that yielded significant savings in time was the introduction of a case conference at an early stage of the review process. The case conference includes the assigned team leader, grievance officer and legal counsel to identify key issues and problems that might cause delays if identified later in the process. The Board is of the view that it is capable of reviewing a broader range of grievances than it does at present. The development of expertise and an efficient process position the Board to take on more files. Every grievor, as well as the CDS, benefits from an independent, external review through the Board's considerable knowledge and unique in-house expertise. The survey provides grievors an opportunity to give the Board anonymous feedback. The information gathered is evaluated on an ongoing basis so that the board can assess the valuable feedback and take appropriate action as required. Internal services support a common government-wide approach to planning, designing, budgeting, reporting and communicating. As a small agency, the Board is required to report on 3 sub-activity levels: Governance and Management Support; Resources Management Services; and Assets Management Services. The Board expanded its Integrated Business and Human Resources Plan to include a Succession Plan. This initiative ensures that HR is a fully integrated element of the Board's business planning and reporting. An Integrated Risk Management Framework was developed and a risk approach incorporated into the CFGB decision-making process. Senior management recently reviewed and updated the Board's corporate risk profile and assigned accountabilities for the implementation of mitigation strategies. The Board also made it a management priority to ensure that the integrity and completeness of information within the organization is not compromised or lost. To this end, the Board not only further developed its records management system and enhanced management applications, it expanded its information management activities to include all the elements of an Information Management (IM) Program: IM Governance; IM Architecture; IM Guidance, Advice and Tools; and IM Policy. In its 2007-08 Annual Report, the Public Service Commission of Canada (PSC) listed the CFGB as one of the top four performers in the Small Organizations category. The classification was based on the assessment of the 2007-08 Departmental Staffing Accountability Reports conducted by the PSC. The CFGB is an active member of the HR Co-op Group established in 2005 and comprised of five small federal organizations with judicial or quasi-judicial powers. The group's mandate is "to explore opportunities to leverage their capacity to implement and sustain human resources management practices that support departmental business objectives and goals of the Public Service Modernization." Last year, the Board shared the HR Best Team Award for 2007 with its partners within the HR Co-op Group for their "innovative approach to sharing information, practice and tools... using a collaborative model aligned with the concept of shared services." The team was recognized by the HR Council, which represents the leadership of the HR community in the Federal Public Service. In 2008, the CFGB continued to highlight the importance of public service values as the foundation for ethical behaviour. One deliverable in this area was the launching of a five-year action plan to promote the Public Service Values and Ethics within the Board. The plan included disseminating information to all employees on key issues, cases and examples, and mandatory training. Employees also participated in anti-harassment and anti-discrimination workshops. The Board believes these activities provide employees with the opportunity to explore the foundational concept of values and ethics, and to learn how to deal with conflicts of interest and resolve ethical dilemmas and accountability issues. Lessons Learned: In small agencies, the lack of depth in the corporate functional areas means that the loss of even one employee can result in a significant loss of corporate capacity. The Board's plans for knowledge transfer and the documentation of processes and procedures strengthened the provision of corporate services. Participation in a variety of interdepartmental groups, including HR Co-op, the Small Agencies Administrative Network (SAAN) and the National Defence Portfolio Council provide opportunities to leverage information exchange and maximize limited resources.